During the second week in Rome we continued visiting several museums as a class because we had a discount card that had to be used in three days time. I think that Friday the ninth broke my record for the number of museums I have visited in a day! We met bright and early at the Baths of Diocletian which has now become a museum that portrays inscriptions from antiquity but is itself an artifact. One part of the museum is inside the original brick vaulted structure that once served the baths. I always find myself inspecting the details where the intersection happens between old and new. In this particular case a modern large spanning roof recreated a covered space in the ruins, and I found that it existed quite harmoniously with the ancient structure. At lunch time we went to the nearby Church ‘Santa Maria Degli Angeli’ which is a church built into the other side of the old baths and was renovated by Michelangelo. The outside is the same stunning brick, but the inside is a decorative interior of various marbles and imagery. I love touching different materials in buildings (I’m nerdy that way), and in doing so discovered that much of the marble is actually fake. More than half of the walls and columns were masterfully painted to look almost identical to their counterparts, likely because the marble had become almost unattainable when the renovation was completed. We went to the church for the specific intention of seeing the Meridian line that was added to the church in the eighteenth century. I was amused by the large gash that had to be cut through a marble cornice to allow the small dot of light into the space. At 1:07 we saw the dot of light travel directly across the line to indicate that the sun was at the highest point in the sky. The second museum that we visited together was the ‘Museo Nazionale Romano’ located in the ‘Palazzo Massimo’. It had a large and varied collection, but the main thing we went to see were the many frescoes and mosaics that were taken from ancient Roman villas. They are stunning and were a joy to behold. This museum building is quite different then the one of the baths. The museum is in what was formerly a three-story Palazzo with a large central courtyard. The Palazzo was largely renovated and modernized, and the architectural elements that attracted me most were a system of lighting fixtures (large aluminum cubic frames that held an adjustable plane that then reflected a spot light onto an artifact), and a new glass facade that was added around the interior courtyard on ground level (therefore converting what was originally an outdoor vaulted space into an interior gallery). I also liked how they recreated the enclosures that held frescoes and mosaics, and then lightly traced in missing portions of the surface. I hope that my photographs will tell you more than my words! 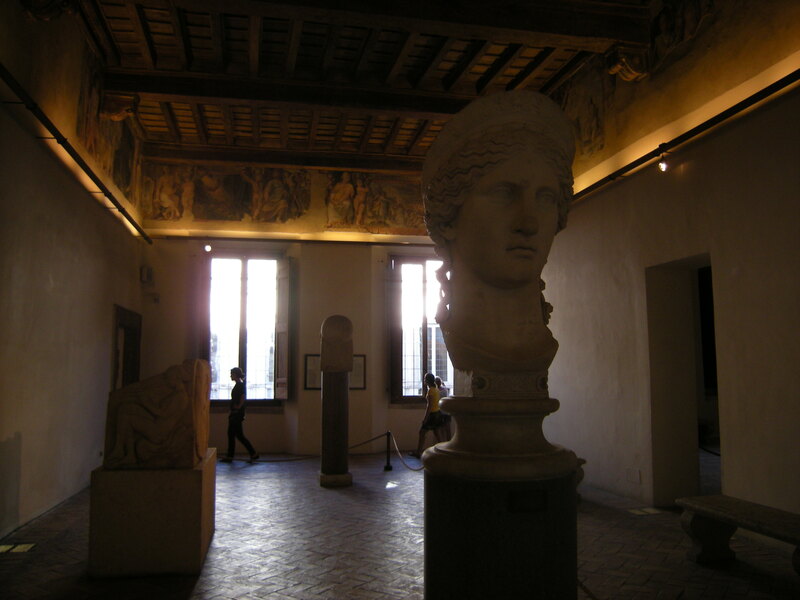 The final museum we visited that day was the Palazzo Altemps. This was my favourite museum of the day – likely because it felt like a genuine Palazzo that had remained almost unchanged. The collection of sculpture was the most intentional and detailed collection I had yet seen, and the spaces themselves seemed to house the artifacts like they would have in their original state. I found myself spending more time examining and enjoying each sculpture instead of experiencing the common blurring sensation of seeing too many things at once. There are a few modern interventions in the building that are much more subtle than in the Palazzo Massimo. In one portion of the museum the floor is removed to reveal a conglomeration of spaces and layers below. In another large space an interesting steel structural system was added to support the existing beams and joists. The following Monday we visited one final museum which was that of ‘Palazzo Spada’. This museum houses an original art collection of the family that once owned the palazzo, and is most famous for an architectural intervention created in the building in 1632 by Francesco Borromini. In a courtyard adjacent to the central courtyard, Borromini created a forced perspective galleria that looks much longer and larger than it actually is. Sloped floors and walls partnered with a decreasing size and distance of columns, fool the eye into thinking that an 8m long galleria is actually 37m long, and that a 60cm high statue at the end of of the galleria is a life-size figure. It is not until one looks at it from a closer angle or walks into it that one can see that one was fooled! 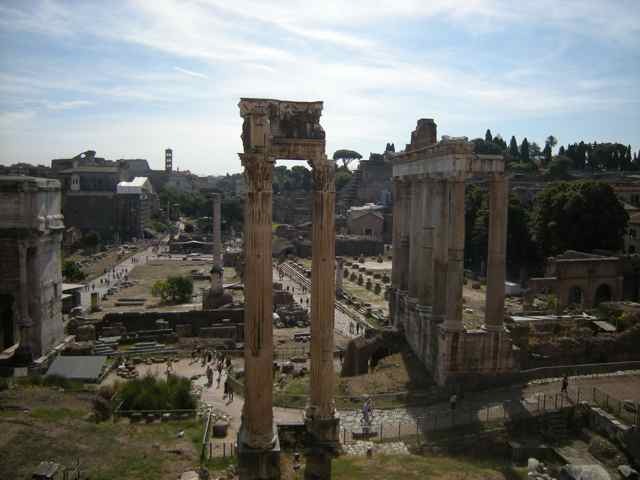 I have now been a week in the city of Rome! It is hard to believe that I am really here. Sometimes it still feels a bit like a dream. I live in an apartment in the neighborhood of Trastevere with four classmates. We have marble floors and high ceilings and tall windows with shutters that open up to a busy street below. In the mornings Italians wake up early, and we more often than not wake up with them to the sound of clanging, rumbling, and cooing. 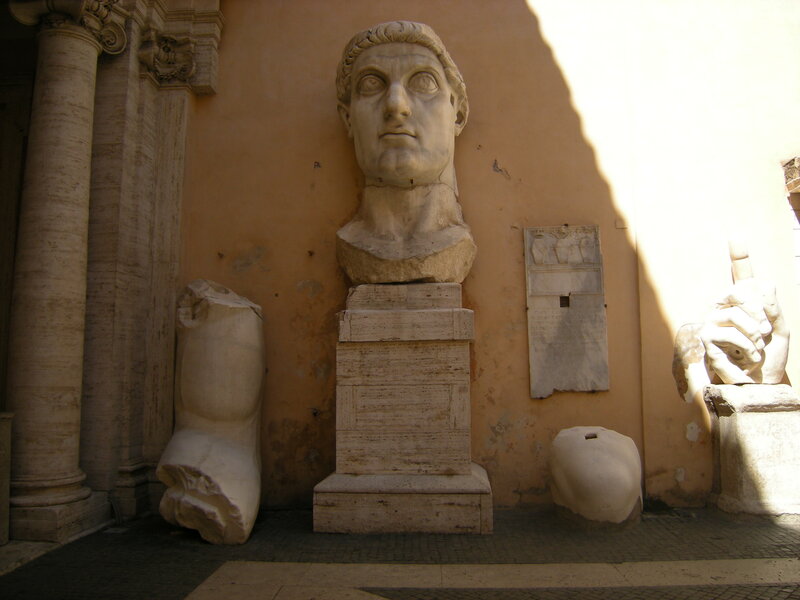 We are located near some small shops, cafés, and restaurants and have a typical Roman street scene: a narrow street with cobblestone paving, plaster stucco walls, and terracotta tiled roofs. During the first few days I didn’t get to see much because it took a while to get settled. My roommates and I went to buy cheap phones, internet, copy keys, go grocery shopping, and find our way around the local neighborhood. Classes began this past Monday and now we are finally getting out and about. 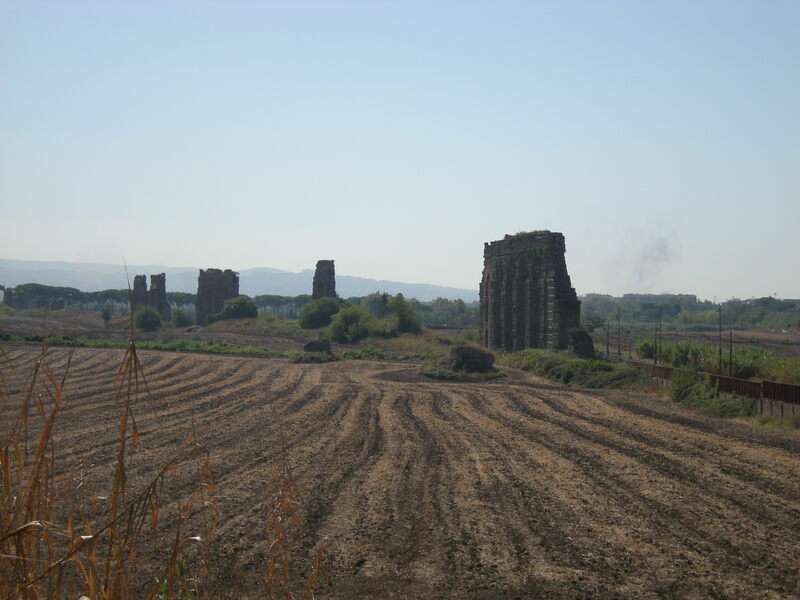 On Tuesday we went on a large walk from the outskirts of the city to the city center, following the broken paths of two ancient aqueducts, the ‘Acqua Claudia’ and the ‘Acqua Felice’. 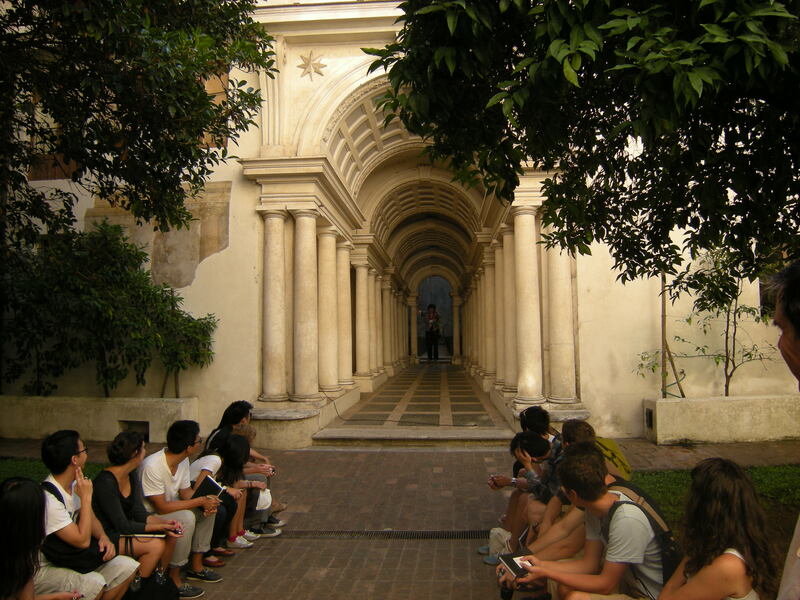 On Wednesday our class went to see the ‘Crypta Balbi’ which is a museum of archeological ruins in Rome. It is amazing to see the layers and layers of history that exists in Rome. 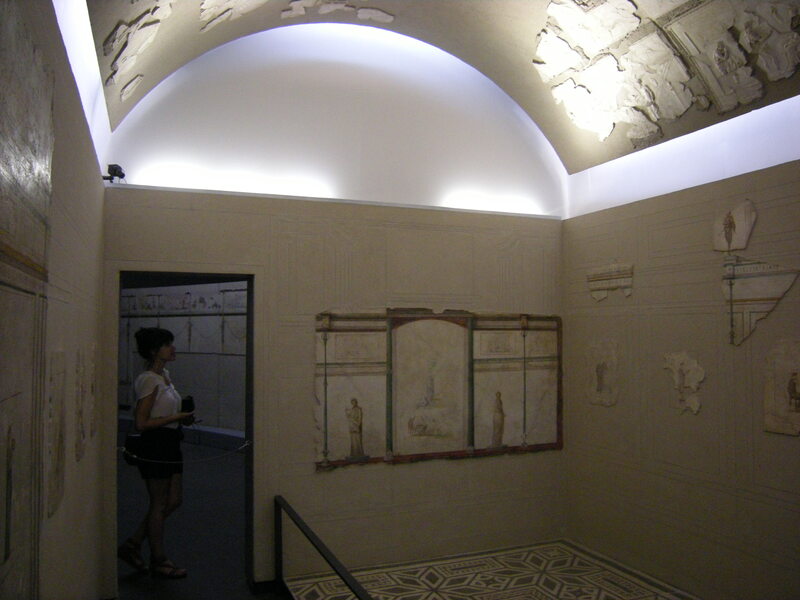 The Crypta Balbi is a modern museum built on, like much the rest of the city, strata from past centuries as buildings and even foundations were reused again and again. Today we went to the ‘Capitoline Museums’ which themselves are historical buildings but are built on even older foundations right on the border of the Roman Forum. 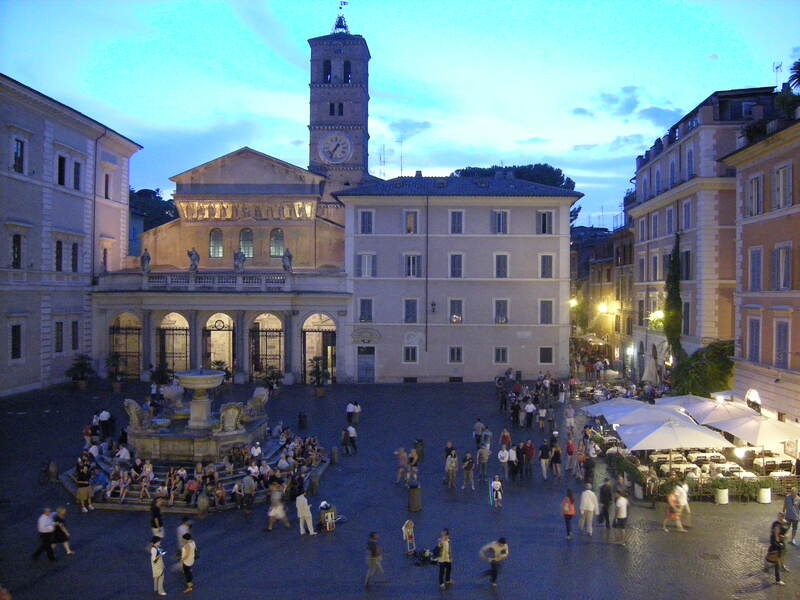 The ‘Piazza del Campidoglio’, the museum square, was designed by Michelangelo and is a remarkable public space. The museum is filled with classical sculpture and it was a wonder to walk through and gaze at all of the empty eyes and lifelike fabric. I saw the bronze statue of Marcus Aurelius on his horse, and the huge remains of the gigantic seated statue of Constantine. Besides going to these organized activities, I have often been exploring with my roommates or on my own. On Tuesday a roommate and I explored the ‘Piazza Santa Maria Maggiore’ where we drew our first sketch of the facade of the basilica. Yesterday we went to see the Pantheon and decided to try and happen upon it without a map. It was easy to do because all we had to do was follow the crowds. The tourist locations in Rome are extremely busy, and so it is nice to be able to say that “I can come back later!”. We actually decided to do just that and postpone seeing the inside of the Pantheon. The crowds were so big that the entire interior was one big crowd of people. I am very much enjoying the Italian culture. Food here is delicious and gelato delectable. We can buy fresh produce everyday from a market in a nearby square. Italian is spoken so fast that I’m not sure if I will ever be able to comprehend, but I really enjoy the rhythm of the language and am learning a bit more every day. Rome is a beautiful city and I wonder if I will ever really know it well because there is just SO much to it! I have four months to try so wish me luck!